Chef Ricky Webster (right) and his team used about 700 lbs. of gingerbread. 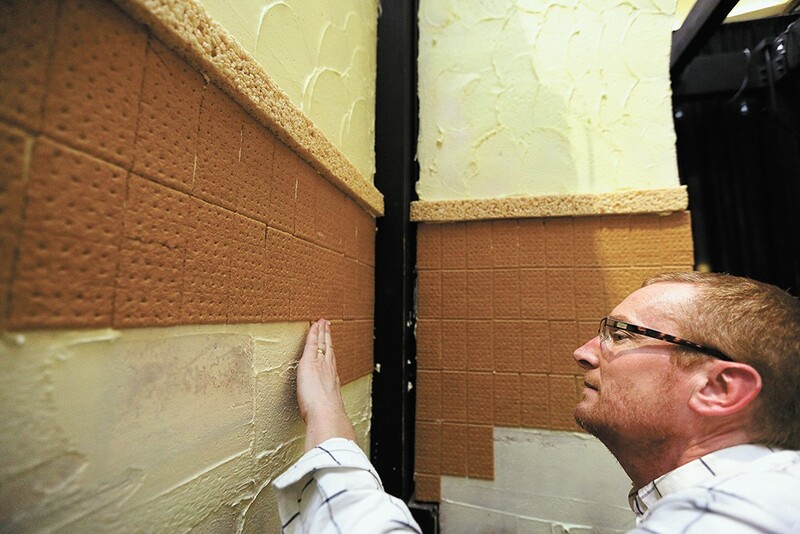 If the walls of chef Ricky Webster's dream house could talk, they'd tell of gleeful and sparkling-eye children, many who've sneaked licks and nibbles of its sugary construction. Last week the Hotel RL corporate executive chef, based at Hotel RL in downtown Spokane, unveiled his confectionary masterpiece, a 150-square-foot, lifesize gingerbread house made (almost) entirely from sugar, butter, flour, eggs and spices. The new holiday tradition for both Webster and the hotel is now on display inside the lobby for all to see through the new year. "It's very whimsical and it speaks to my heart," Webster reflects. "I dreamt of this as a kid — I just want to step inside the Hansel and Gretel house. I want to see what the window sills are made of, and I want to touch the wall. If I can invoke that in a kid and check that off someone's list, I will be happy." In this case, the windowsills of white royal icing are framed with Rice Krispies. Little plants with leaves of green fondant, alongside a collection of peppermint sticks, lollipops, gumdrop trees and other sweets, fill the magical home's window boxes. Inside, Webster's house is quite current with contemporary home design trends, featuring graham cracker wainscoting, a Rice Krispie chair rail and, above that, an icing stucco of pale yellow. The cozy fireplace mantle is coated with a layer of multicolored sprinkles. Even the framed artwork on the walls could be eaten, including a colorful landscape scene that Webster pieced together from hundreds of individual jellybeans. "I think that my childhood whim is a lot of what motivates me," Webster says of the project, which he oversaw alongside Hotel RL pastry chef Megan Gaines. "My mom and grandmas and I would sit down and do gingerbread houses every year. I always imagined myself living in it," he continues. 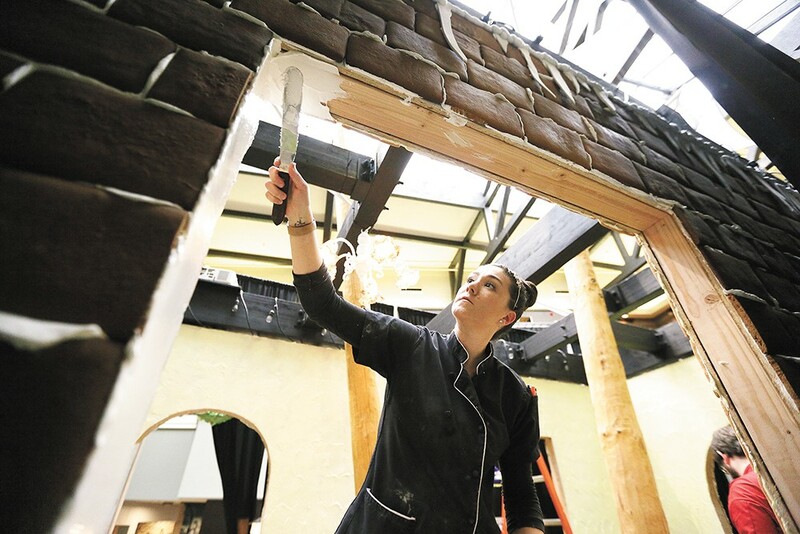 Hotel RL pastry chef Megan Gaines put her skills to the test on the project. Despite a deep background in pastry making, and past roles including working alongside Ace of Cakes' Duff Goldman and as executive pastry chef of Ace Hotel in downtown L.A., Webster didn't have an opportunity to bring his lifesize gingerbread house dreams to life until landing his gig with Hotel RL in February. Though he's based in Spokane, Webster oversees the culinary management of five other Hotel RL properties. "There never was room [in L.A.] and when I saw how much room we had in this lobby and they let me hire a pastry person, the two of us got scheming and I pitched it back in June," he explains. In addition to all the multiplication to determine how much of each ingredient (see "By the Numbers," page 40) they'd need, Webster's team also had to ensure the sheer weight of all that butter, sugar and flour would be safely supported. "You're walking into a house made of candy and cookies, and I had to make sure it was safe, so there are inedible structural supports," he explains. "After that it is really about me making sure that it's all edible — that is the whole point." 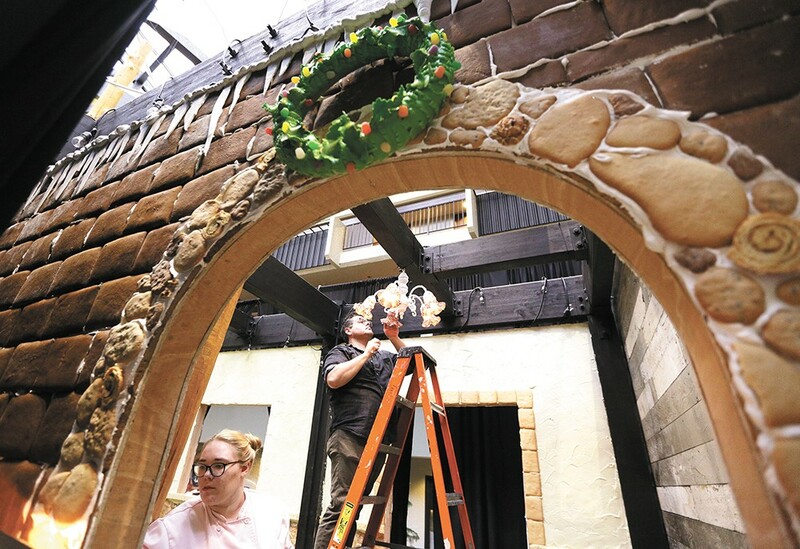 Beneath layers of royal icing and 5-by-7-inch bricks of sweet-and-spicy gingerbread, the house is supported by walls of wood that were designed by a team of engineers for Hotel RL to carry a load of more than 1,200 pounds of candy, cookies and icing. Beyond that, everything else can be eaten, though guests probably wouldn't want to do so (not the least of reasons for which being all the handling by staff and visitors both). The bulk of gingerbread bricks were baked months ago to allow the cookies to set before being glued to the walls with sticky icing plaster. Gaines and Webster baked batches of the gingerbread as often as they could fit it into their daily schedules running the hotel's kitchen, completing more than 1,100 of the cookie bricks since September. To ensure that curious little fingers and mouths don't bring too much wear and tear upon the sugar structure, Gaines plans to walk through the house each morning to make any needed repairs. Executive sous chef Chad Wallace put up finishing touches with care. Consideration of the sheer amount of otherwise edible ingredients needed for Webster's lifelong gingerbread dreams to become reality wasn't overlooked when the team set out to build the lifesize holiday attraction. The chef says many of the ingredients were donated, including damaged or expired (and thus inedible) bags of flour and sugar from commercial food suppliers that otherwise would have been thrown away. "The grand scheme of things to make it more special is to tie it to Blessings Under the Bridge," Webster says. "We thought if we're going to do this, let's make it a little more meaningful. It's a passion project, but it's also getting a lot of people in the community up and out and excited." To support Blessings Under the Bridge, a local nonprofit supporting Spokane's homeless population, Webster and Gaines created a special themed treat menu from which a portion of proceeds will benefit the nonprofit. Orders for cookies ($3-$5), beverages and even gingerbread house kits ($12) to take home can be purchased from a window inside the gingerbread house during regular visiting hours. On select Saturdays in December (the 2nd, 9th and 16th), from 1-3 pm, Gaines is also leading gingerbread cookie decorating sessions for kids. "The buzz is great. I had worked this hard in L.A. for seven years to get this much attention in the city as I'm getting just for this one project," Webster reflects.